Eczema Should No Longer Be A Problem - I Am Proud Of My Kids! It is so much distressing to see your baby’s skin itch even for one second. October and November carry their own set of goodies that we all look forward to every year. With all the excitement in the air, eczema should be the least of your worries. Children are more predisposed to this condition now than in any other time of the year. You better act fast! Low humidity and extremely cool temperatures fan eczematous dermatitis (the reaction). Ever wondered how your skin remains moisturized during summer? The Ambient humidity comes to our rescue! In winter however, there is very little humidity in the immediate atmosphere. Tender skin becomes itchy ofttimes. When scratched, boom! The eczema turns into an uncontrollable blaze. Children are affected differently by this condition. Some might just experience it mildly while others get the full version of it. Poor children! There are lots of medicated prescriptions out there to control eczema. However, it is better to fight this condition the natural way. What natural ways should you use to keep your child protected? Protection comes first before anything else. If you keep your child away from the predisposing conditions, she won’t catch eczema in the first place. Keeping your child indoors and ensuring that the humidity and the temperatures in your home are perfect could go along way into curbing eczema. Eczema definitely looks worse on sun damaged skin. Keeping her indoors or by using sunscreen with an SPF of 30 or above will prevent this. This technique comes in handy when your child already has already contracted the condition, but is in the initial stages. Of course, it can only work if your child can tolerate the ice. We all know that scratching flares up eczema. Ice relieves the urge to scratch the skin thus helping keep the condition at bay. Polyester and wool could further strip your child’s skin of moisture. Opt for more friendly clothing material such as cotton. They definitely grow out of it! Just like teenage acne, your angel will definitely grow out of this condition. A child’s skin will toughen up when she reaches age 10. Use natural moisturizers only if you find it necessary to use them or when prescribed by your child’s dermatologist. 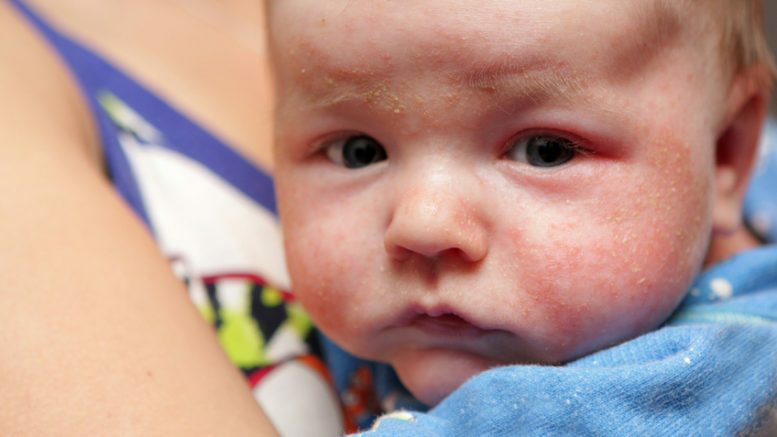 Be the first to comment on "Eczema Should No Longer Be A Problem"